As a member of the Information Technology department, Lauren is part of the team responsible for the effective technical operations of the firm’s business systems. In this role, she is responsible for the day to day technical support of Duke CE’s financial operations as well as enhancing the capabilities of these business systems to better fit the ongoing needs of the firm. Lauren joined Duke CE in August 2012 to support the financial software system implementation. 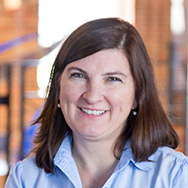 Prior to joining Duke CE, she worked on several database project implementations and spent many years in Information Technology support roles at various companies. She has worked for Cisco Systems, Nortel Networks, All Kinds of Minds, and UNC General Administration among other organizations. Her primary expertise is in database management and development. Lauren got her undergraduate degree in Mathematics from the University of North Carolina at Chapel Hill and her Master’s degree in Math Education from NC State University. She has two children in college and lives in Chapel Hill with her husband.